Medals motivate. They symbolize dreams, sweat equity, memories, and success, regardless of the distance. Don’t believe me? The fact grown adults will wear a Boston Marathon medal on the airplane ride home 24 hours after having run 26.2 miles is testament to the emotional power that one small 2” piece of metal contains. In fact, I once paced a runner who ran the Miami Marathon simply for the medal, only to donate it to a children’s organization. I couldn’t fathom the thought of parting ways with my beloved bling. Just looking over my racks of countless medals brings a smile to my face. Medals are magical storage devices of friends made, race time weather, nearly missing race start, family support, victories and failures, or even sheer agony. Medals inspire. There are many great things about running. I enjoy its duality of simplicity and complexity. It requires little athletic ability in the form of eye-hand coordination and virtually no equipment. It doesn’t discriminate in age, gender, race, or financial capabilities. There really are no prerequisites! Yet for others it provides challenges in strategy, preparation, and adaption. But best of all, it offers opportunity for victory or defeat for each person who chooses to try. That’s what distinguishes it from being a game; it is a sport in which the best of the world and the newest to try will compete on the same course, on the same day, against all manner of personal challenge. You don’t have to be the best; you just have to get started and move… with a medal in your sights! What I’ve come to realize through coaching, pacing, training, and racing is that you need a plan to get from point A to point B. And, with today’s virtual races, point B is even more accessible and less daunting to those aspiring to a finish line but perhaps wanting to avoid flocks of runners and focus more on the individual aspect of the sport. Either way, all you need is a plan. PICK a 5K. Across the country, 5K races are in abundance each weekend as well as an ever increasing number of virtual races. In fact, last year nearly 17 million runners crossed a formal finish line. To get started with running, you need only turn your attention to the Runner’s World Race Finder to find one in your area or choose a medal and pick your date to complete at VirtualStrides.com. Plan for a race that is at least 5- 8 weeks out from the current date. This is the beauty of the virtual race; at Virtual Strides, you pick the distance and corresponding awesome medal and charity it supports, then complete your race whenever and wherever you like. This will allow you sufficient time to increase your walking and/or running for a manageable 5K (3.1 miles) race. There are many effective and novice 5K training plans on the internet, and the one I recommend most is Hal Higdon’s. His plans cover the novice as well as the experienced runner at all distances. But, if you’re starting out, the important concept is to walk or run 4-5 times throughout the week with varying distances and paces. Hal Higdon does a nice job of laying out how much to run and by consistently following the plan, you will see a progressive improvement. LET everyone know. Post to social media. Tell your friends and family. Shout it from the rooftops! When you share a goal with others, watch your commitment and focus increase… no backing out and no more excuses! With others rallying behind you, your drive to succeed naturally improves. With all the instant sharing of information via social media channels, work it to your advantage! ARRANGE to join a walking or running group. From virtual training groups to local fun run groups, there’s no limit to finding others with whom to walk or run. Again, let the internet be your friend and head to Road Runners Club of America to find a group compatible with your schedule and location. In my area, there are no less than 6 fun runs weekly with all sizes, ages, goals, etc… Most runners I know, even those who are elite athletes, are nothing but the nicest, most encouraging people I know. They will encourage you and cheer you on. NUTRITION matters! Like a car, your body runs best with optimal fuel to include the right type and balance of protein, healthy fats, and carbohydrates. What’s more, crossing the finish line requires proper nutritional recovery to get ready for the next training run and race. This is the most overlooked part of a runner’s training, and yet it’s the easiest to implement! Make your plan today to create memories while improving your health and, oh yes, let’s not forget, earn a nice piece of hardware while you are at it. Kristen Tinker is a private wellness, nutrition, and fitness coach. 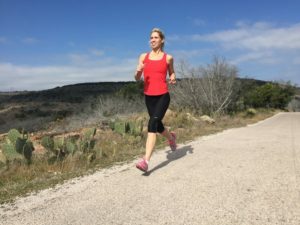 For the past decade, she has raced marathons and has worked as a professional distance and marathon pacer. She can be reached at PacerKristen.com.